I've said it before but I don't really do romance novels or chick-lit, so when something like this comes along I'm pretty wary of how much I'll enjoy it. Eleanor sticks out with her less than conservative appearance, she's bullied and alone. Even the boy she sits next to on the school bus doesn't acknowledge her. Until he starts giving her comics and mixtapes then the perfect friendship turns into a love. The fast, passionate, can't live without you kind of love. Where do I begin with how much I loved this book?! 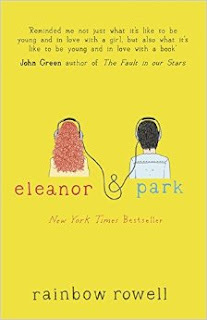 It completely wrapped me up in Eleanor and Park's world and made it difficult for me to leave once I'd reached the end. I found it difficult to concentrate on any other book for quite a while after reading this because I enjoyed it so much. It was just perfection in a novel. The funny thing is I can't actually place what makes this book so good, yes the writing is good, the characters are brilliant and are written about in depth, but at the end of the day the story line isn't anything groundbreaking. Yet it manages to absorb you completely. I think because it's so relatable it makes it extra difficult to put down. If you haven't yet gathered, I urge you to read Eleanor and Park and be transported back to the days of young love.